Over the years Capt. Karty has had the opportunity to fish anywhere in the world. He chooses to stay in Mosquito Lagoon chasing the reds. Many of our anglers have been offshore fishing in the New Smyrna Beach area. They almost all say they caught bigger fish and had more fun with Capt. Karty. Offshore fishing is more passive style of fishing. You spend much of your trip time riding and trolling or bottom fishing. In Mosquito Lagoon there is nature all around, no sea-sickness concerns and everyone will have a blast. Bring your kids! The fishing is active- stalking the redfish and getting to see the fish take your bait. 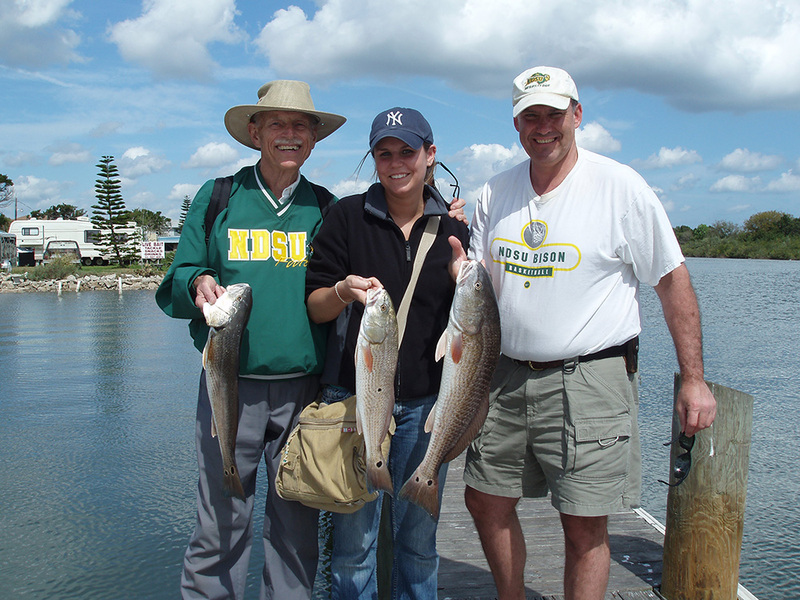 Ladies often feel that they are not welcomed on fishing trips, but not with Capt. Karty. Everyone is welcomed and given the opportunity to catch fish. 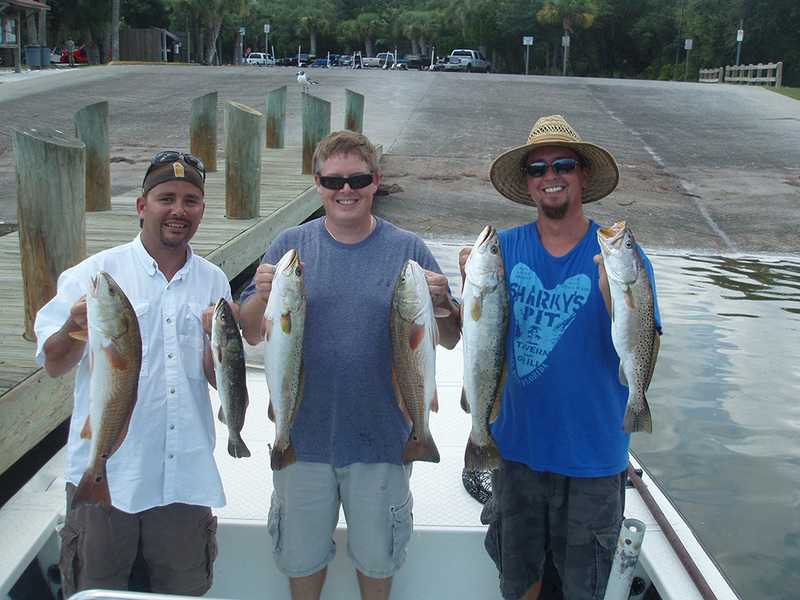 If you are looking for a different fishing charter in Florida, this is the place for you. Tampa Charter Fishing offers Tampa Bay fishing at it finest whether that means inshore flats fishing or deep sea fishing offshore for grouper, snapper, and other top Florida sportfish species. Check out Fishing in Fort Lauderdale for marlin, tuna, sailfish, and more aboard the 50' charter boat Fanntastic skippered by Captain Mark Fann. Captain David Ide skippers aboard the Lady Pamela 2 offering Fort Lauderdale Sport Fishing deep sea charters. For all the big game species, contact Fort Lauderdale Deep Sea Fishing and come aboard the Shooting Star Charter with Captain Dave Baldwin. Miami Sport Fishing at its finest. Experience exciting sportfishing in Miami and Fort Lauderdale aboard Lady Pamela. Islamorada Deep Sea Fishing Charters - Offering fishing in Islamorada with Captain Ron Howell Fishing Charters for a wide variety of fish from offshore to inshore species. Sport Fishing Fort Lauderdale - Join All Inclusive Sportfishing for some exciting fishing in the Fort Lauderdale sun with Captain Rick or Captain Steve, two of the most experienced Captains in South Florida. Naples Charters offers inshore and offshore fishing in Naples for a variety off well known Florida fish species, all caught from the Ms B Haven with Captain Mike Bailey. Fishing Charters offers fishing articles and reports written by top fishing charters and guides from saltwater and freshwater fishing regions. Fishermen post and vote on their favorite Fish Pictures. Nailors Fishing supplies a range of Carp Fishing Tackle, Fishing Tackle, Fishing Accessories in Southampton at brilliant prices. FellowFishermen.com is your site for everything fishing and angling. Start connecting with your fishing community today. Northeast Angling TV Saltwater Fishing offers Free video and instruction for inshore/offshore fishing for Striped Bass, Fluke, Shark, Tuna, Striper, Flounder, Sea Bass and much more! Travelindex.com is the world's largest travel directory with direct connect contacts. This is the official Website of the Travel and Tourism Foundation. Free Info Directory - Arts, Crafts, Collectibles, Design, Photography is your family internet directory with Arts, Crafts, Collectibles, Design, Photography, Gallery, Illustration, and Painting. • Chesapeake Beach Fishing - Join Kyran Lynn Charters and Captain Marty Simounet for an exciting day of Chesapeake Beach fishing for striper, drum, and other Chesapeake Bay game fish. • Striper Fishing Chesapeake Bay - Find the perfect boat to fit your needs for Chesapeake Bay and Chesapeake Beach striper fishing in Maryland. • Virginia Beach Fishing Charters - Join Captain Troy of Seaduction Charters for an outstanding day of Virginia Beach Sport Fishing for tuna, marlin, dolphin, striper, and much more. • Canadian Hunting and Fly Fishing, Newfoundland Big Game Hunting and Fly Fishing, Grey River LodgeBig game hunting for Woodland Caribou, Black Bear and Moose, fly fishing for Atlantic Salmon, upland wingshooting for Ptarmigan, hiking and nature viewing. • Fly Fishing Trips, Vacations, Equipment & Gear. Articles & Techniques. Fly Fishing trips, vacations and information on equipment and gear. How to articles on casting, knots and fly tying techniques. Vermont Fly Fishing - Come to Vermont and spend a day, a week, with Youngs Fly Fishing and owners Bob and Sandy. Enjoy Cape Hatteras Deep Sea Fishing Charters with Captain Jake Hiles aboard the Matador where you will catch all the big game species that call the Hatteras fishing grounds home. Visit Cape Hatteras Fishing Charters for more information on exciting Hatteras fishing that includes offshore fishing for tuna, dolphin, and more. Baltimore Fishing Charters - Come enjoy a day of Baltimore striper fishing in the upper Chesapeake Bay with Trophy RockFishing Charters and Captain Rob Hunter who will put his Chesapeake Bay fishing experience to work for you. Enjoy a day of river fishing for trout, musky, and more with Captain Travis Honeycutt and our other Asheville Fishing Guides. Come fishing with Charleston Charters in South Carolina and enjoy some of the exciting fishing that Safe Harbor Fishing offers. Catch marlin, wahoo, sailfish, and other great big game sportfish. From Chesapeake Beach to Baltimore, Chesapeake Beach Fishing offers fishing for striper, spot, croaker, and much more. Enjoy a day of Chesapeake Beach Charter Fishing for striper, spot or croaker, and other popular Chesapeake Beach species with Captain Stacey Witherow of Mary Ellen charters. When fall and winter approach anglers in Virginia, they know it is Virginia Beach Striper Fishing time so check them out, book your rockfish charter today and go striper fishing. Join AquaMan on an awesome Virginia Beach Fishing charter with Captain Nolan Agner at the helm for a day of spectacular Virginia Beach fishing inshore or offshore for a variety popular saltwater species. Come and enjoy a fun day of Virginia Beach Fishing for marlin, wahoo, sailfish, dolphin, and inshore species like trophy striper with Captain Dan McClarren of the charter boat Long Time Com'n. Finseeker Sport Fishing offers Virginia Beach Fishing Charters of all types and styles that includes trips for stiper fishing in Va Beach to offshore big game sportfishing for marlin, tuna, wahoo, and all the popular bluewater species that call the Virginia Beach fishing region home. Come to Oregon Inlet Charters to go fishing in the Outer Banks aboard the Sea Note, a top NC sportfishing vessel owned and operated by Captain Benjie Stansky. Customized Montana fly fishing packages include accommodations with the regions finest Montana Fly Fishing Lodges hotels, cabins and rental homes and will be happy to design the perfect fishing vacation for your time away from home! Captain Lou offers Long Island Fishing charters on the Capt Lou VII and Capt Lou VIII head boats for sea bass, blackfish, cod, and much more. Experience Lake Erie Perch Fishing Charters and sport fishing aboard the Rampageous with professional Lake Erie fishing guide, Captain Mike Langer while you catch walleye, perch, and steelhead. Enjoy a great day of Salmon Fishing on Lake Ontario or Hudson River striper fishing with Ace Charters and Captain Jim Samia. Action packed fishing entertains on Lake Erie Fishing Charters for walleye, yellow perch, and more with Lake Erie fishing charters, WallHanger Charters with Captain Jeff Bastulli. Join Lake Texoma Striper Fishing Guide Captain John Brett for a day of Texoma striper fishing Texas style. Punta Cana Fishing - Come to the Punta Cana tropical paradise and enjoy warm sun, soft sandy beaches, and Punta Cana fishing which is often called the sportfishing capital of the world. Papagayo Costa Rica Fishing offers Costa Rica fishing trips out of the awesome Guanacaste fishing region (Tamarindo and Papagayo) for marlin, sailfish, roosterfish, and many other big game species. Come fishing on a Costa Rica Vacation and enjoy one of the most awesome sportfishing vacations of your dreams that you will remember for a lifetime. Enjoy some exciting Papagayo Fishing in the gulf of Papagayo regions in Liberia Costa Rica. Fish out of Flamingo beach on the Pacific Ocean with top local Captains. Papagayo Fishing Charters include over ten of the top Costa Rica fishing boats for fishing in Papagayo, Tamarindo, and the entire Guanacaste region catching roosterfish, sailfish, and all the great sportfish in northern Costa Rica. For fishing charters in the legendary Golfo de Papagayo in Costa Rica, Guanacaste Costa Rica Fishingcharters offers inshore and deep sea fishing charters with local captains. Costa Rica Sport Fishing Tamarindo at its finest with Club Villas Pacifica where you will fish aboard the finest boats with very knowledgeable and experienced English speaking charter boat Captains.